Gone the day when only stage performance could help you to show your creativity!! But now the world is moving faster toward Digitalization & YouTube take place of all such alternative. You can use YouTube to upload your video and get popular worldwide in very short time. 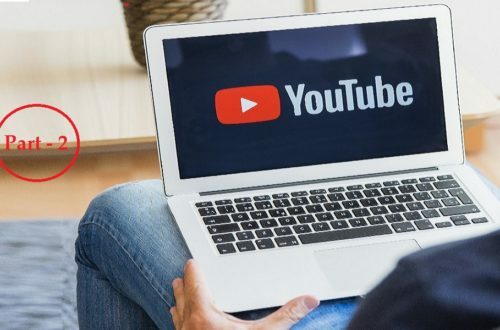 Many people have the video to upload but how to create a YouTube channel and upload video is one of the major queries for several of them across the globe. 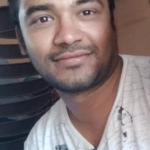 You can upload cooking, teaching, mimicry, comedy or any type of video on YouTube & start making money online on each view even while sitting & sleeping at home. There are many famous youtuber worldwide & Indian youtuber, who choose YouTube as the career & earning in million dollars monthly!! Yes, I am saying million dollars monthly by just upload video. If you read about famous youtuber then I can bet, at least once you thought of creating a YouTube account and upload videos to start making money. Note:- Main rule of success as youtuber is to choose creative youtube video ideas which people are very urged to see with correct equipment. If you are not aware of how to create a YouTube channel and how to upload a video to YouTube, then there are no more worries now. You are already at the correct place & Here I am going to show you steps to create a YouTube channel and process of uploading videos. People who love to create videos, documentary, short film and want to famous in front of cameras. You must have ability to create video using camera or your mobile and have knowledge of software like camtesia to make it perfect. You can also check our post of essential skills required to create video as well as equipment one can use to make video easily. 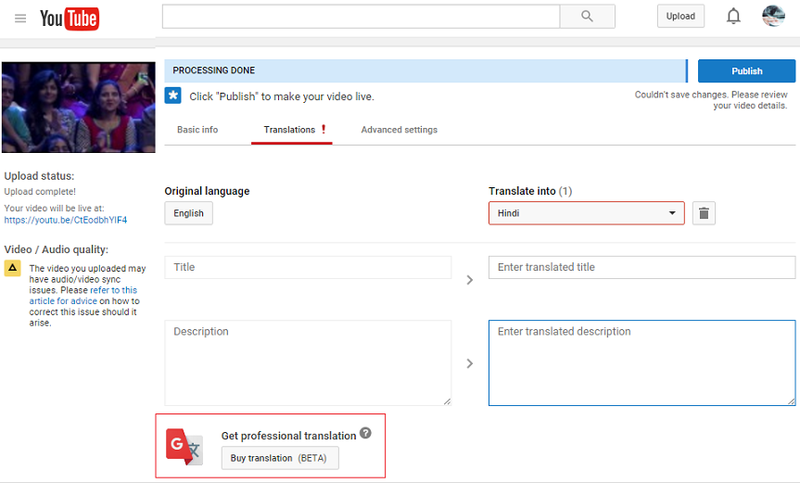 You just need to spend few minutes to start a YouTube channel , I can say max 10 minute it take to setup YouTube channel perfectly and start video uploading process. As you know YouTube is owned by Google so In order to access YouTube, you must have Google or Gmail account. So let’s start from sign up. Step 1: Go to YouTube account and click on sign in button (top right corner). Step 2: Once you click on sign in button you would get the new screen. Next, fill all required information in given form and then move to next step. You need to verify your mobile number and email address (send by Google on given mobile number and email address respectively). Once verified both, your account gets activated on YouTube. Steps 3: After signing up, now we move to create a YouTube channel. In order to do this please click on setting ( ) image near create studio as below image. 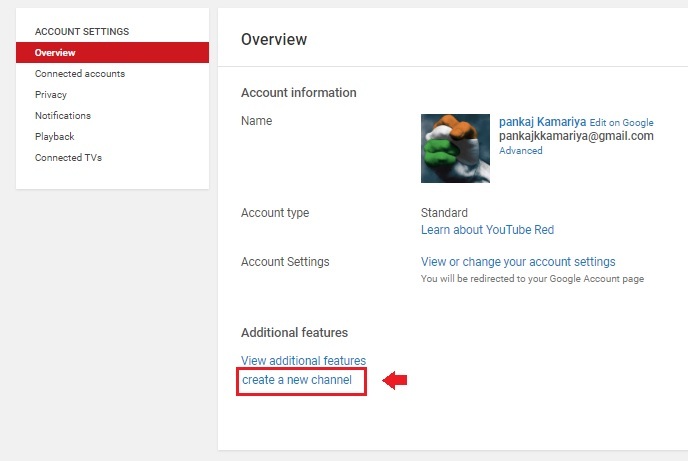 Step 4:- Click on ‘create a new channel‘ link as shown in below image. If your YouTube account already has channel then you would see link “See all my channels or create a new channel” so click on that link else creates new channel. Step 5:- Once you click on the link it will ask to provide suitable channel name (I am giving stuffonix). Then tap on Create button. It will create YouTube channel with name ‘stuffonix’ as below Make sure to give some suitable name as it is going to be your brand name. Step 6:– Now we will select appropriate profile image for YouTube channel which shows purpose of channel. So in order to add new profile picture please click on box as below. Once you click on above pencil icon ( ) it ask you to edit image on Google plus. Please click on edit…once you click on edit.. you would be transferred to Google+ account. Please move mouse over profile pic and click on camera icon as show above. Then upload or drag best suitable picture for your channel. Similarly, change the cover photo of YouTube channel and Select relevant image from your computer or mobile. Step 7 –In order to upload the video, first click on upload button at the top right side of your screen Then select video file or drag and drop file which you want to upload. 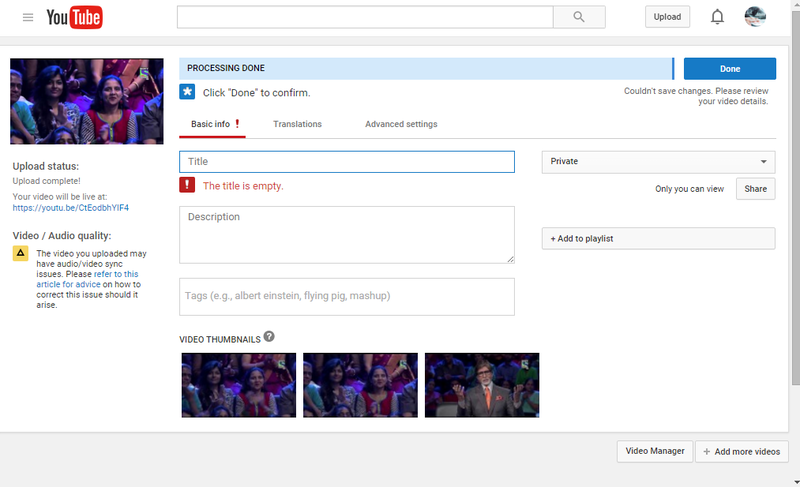 Below uploading option there is one more option to decide whether you want show video to public or not. Once your video start uploading then you get option to provide information and setting about your video. 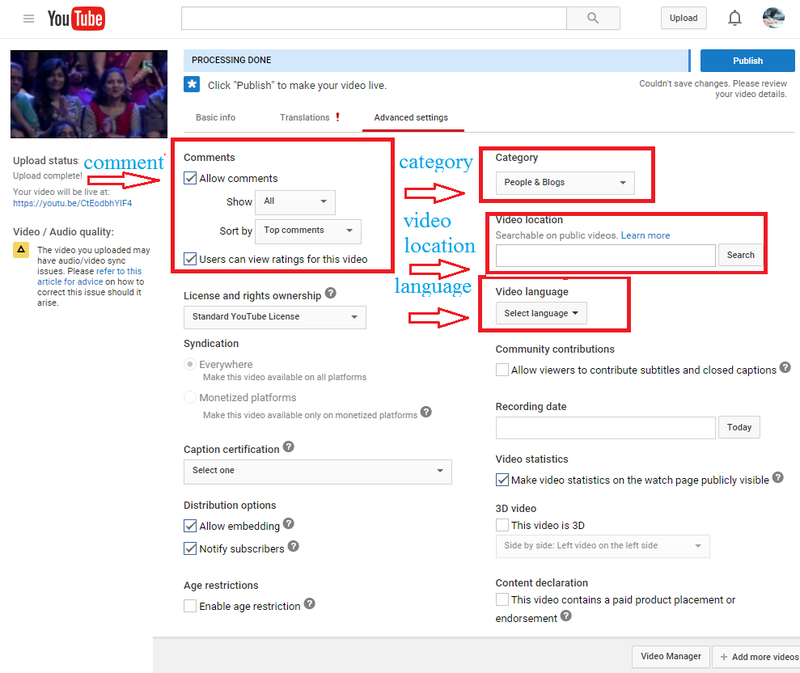 Step 8:- Once you upload any video, YouTube redirect you to other page to provide some information about uploaded video . 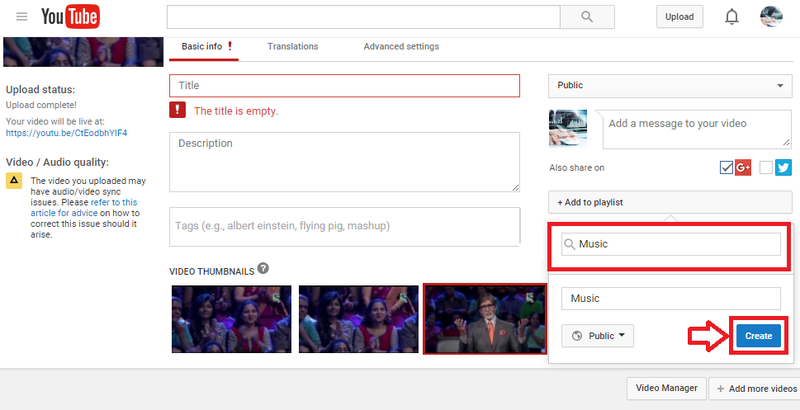 Basic info :- In this tab you need to put the title of video & description. Beneath the description box add tags and keyword that increase the likelihood of viewers finding your video .at last of left hand side you could see option to set thumbnail so please select any one which you want to see as video image. On the right hand side of same tab, there is option of set your video public view, private or unlisted. default one is public that means every one can see this video. Add message related to video on below box and select Google plus checkbox and twitter check box to share video on both social sites automatically. Create play list to disguise between your topic. The Add to Playlist tab allows you to create groups of videos to watch in a particular order. Now you can upload video directly into your Playlist. Translation :- In this tab you can translate into other language, you can even use this service by pay few bucks to professional translator. In advance option you are allowed to disable comments and display or hide the number of views you have had.You can select language, set recording date and change video category as below. Now go to the blue button on the top right side to publish your video .That’s it!!! you are done with all process….now whole world can see your published video..
Hope you like this post and now know well how to create a YouTube channel and how easy to upload video on YouTube.